This Moroccan style vegetable tagine with chickpeas is a tasty vegetable stew, perfect for feeding a crowd. It’s packed with vegetables and chickpeas and is full of all the flavours of the Mediterranean. Who doesn’t love a steaming hot bowl of stew on a chilly day? It may be Spring but it’s still early days and those early days are definitely on the cooler side! This Moroccan vegetable tagine is perfect for days like that. Warming, filling and healthy, this is perfect for a weekend dinner. Spicy and full of flavour this vegetable tagine is easy to make and tastes great. It does take a little longer to make but is so worth it! A tagine is a North African stew, usually consisting of spiced meat and vegetables. The stew is prepared by slow cooking in a shallow earthenware or clay dish. This earthenware dish is also called a tagine, it has a conical lid, the base is wide and shallow. A dutch oven is a good substitute if you do not have an unglazed earthenware tagine. Veggies: Cook up the onion then add the eggplant/aubergine and the zucchini/courgette. Cook up those veggies on the hob for just a few minutes. Spices: Next add your spices, cumin, coriander and cinnamon bring the flavours of the Mediterranean to this vegetable tagine. And then add the harissa paste, this is one of my favourite things! The harissa adds the spice and the flavours of Morocco. Liquid: Every good stew needs a liquid to cook up all those lovely veggies! Canned diced (chopped) tomatoes and good vegetable stock are perfect for this vegetable stew. More Veg: Sweet potatoes are perfect in this tagine, cut into bitesize chunks they will bulk up your stew and make it a complete meal. 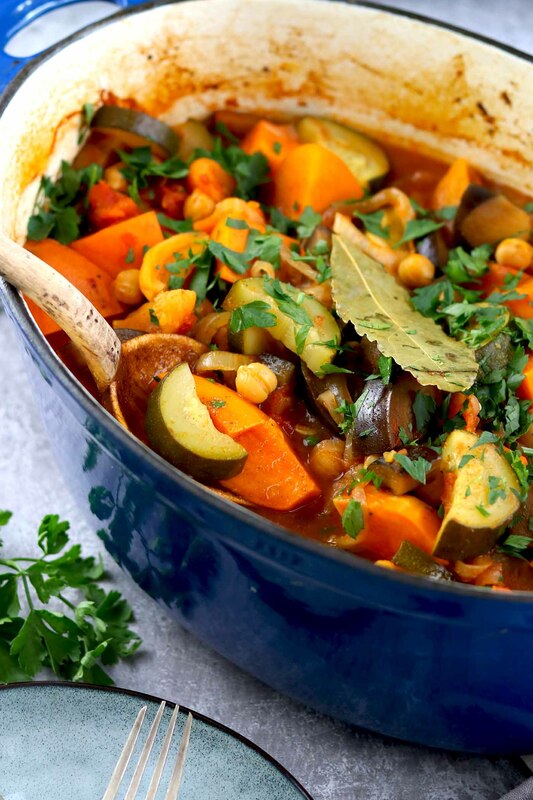 Legumes: I add chickpeas to this vegetable tagine, they add some texture and of course protein. You could add lentils if you prefer. Sweet: Ready to eat dried apricots add a lovely sweetness to this dish, as does the hint of honey. You could also add some raisins too if you like. Cook: Pop it in the oven and cook it for 20 to 30 minutes, until the sweet potatoes are cooked through. Serve: For the final touches add some finely chopped flat leaf parsley and you are done! We like to have this with couscous or rice. You could try adding some flatbread to soak up that sauce, and a dollop of sour cream is really nice too. Yes, you can. To freeze this dish allow it to cool completely, then pop it in a freezer-proof container. It will keep in the freezer for up to 2 months. Thaw it overnight in the fridge then reheat it on the hob in a saucepan until piping hot throughout, stirring occasionally. Some texture changes may occur due to the high content of the zucchini/courgette, but it should still taste great. Yes, you can make this ahead. You can make it a day ahead of time, just don’t add the parsley until just before you serve it. Veggies: Switch up those veggies, this is a really flexible dish! You could switch out the eggplant/aubergine for bell peppers or add them in as extras. Carrots also work well in this. You could also switch the sweet potato for white potatoes however they will need to be waxy potatoes otherwise they will disappear into the sauce. Legumes: You could use butter beans instead of chickpeas if you prefer. Lentils are also great in this, add dry red lentils or a can of cooked green lentils to switch it up. Heat: This dish is on the spicy side however if you prefer less heat then simply reduce the amount of harissa you use, half a tablespoon should do the trick. A spicy Moroccan style vegetable tagine, perfect for feeding a crowd this vegetarian stew is packed with veggies, chickpeas and sweet potatoes. Heat the oil in a large dutch oven or casserole dish with a tight-fitting lid. Add the onion and cook for about 1o minutes stirring often. Add the eggplant/aubergine and garlic and cook for about 2 minutes then add the zucchini/courgette and cook for another 2 mins. Now add the spices and stir well, then add the harissa. Stir everything together. Pour in the minced (chopped) tomatoes and the stock. Then add the sweet potatoes, chickpeas, apricots and honey and stir everything together. Add the bay leaf then place the lid on the dish and pop it in the oven. Cook for 20 - 30 minutes. Once the sweet potatoes are cooked and the sauce has reduced a bit then your tagine is done. Serve with couscous or rice with extra chopped parsley. Nutritional information is approximate and does not include couscous. You do not need a clay tagine to make this, I don't have one and made in this is a dutch oven/casserole dish with a tight-fitting lid. If you wish to make this recipe vegan, you should use a vegan stock and omit the honey. You could use agave nectar or maple syrup if you wish. Any leftovers can be stored in the fridge and reheated the next day on the hob or in the microwave. For freezing instructions please see the post. This recipe is on the spicy side, if you plan on serving this to young children then you can reduce the heat by reducing the amount of harissa you use. Half a level tablespoon should do the trick. Also please be aware that children under 12 months of age should avoid honey altogether.